(Sundby, Denmark)- The WOW organization has now joined the Danish J/70 Sailing League and will have their first event in Sundby, Denmark from September 22nd to 23rd. The format will be the same as the open sailing league, eighteen teams of five women on board each boat, with teams rotating on each flight. The WOW concept is off to a flying start. Over 200 women have joined the network - and it does not stop there. "Both Henriette Koch and I have an elite sailing background, but it was not what we wanted. 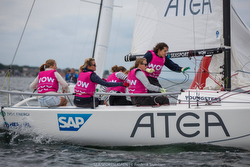 The most important thing is to get more women sailing,” said Josefine. “Henriette is somewhat older than me, and she was the one girl I looked up to, she often beat all the boys. I have seen many girlfriends stop sailing because they did not fit into the elite and Olympic sailing environment. There are many skilled young girls. But, there are no fun opportunities (or divisions like in soccer) for those who are not the top five percent. That is what we will try to improve. So, this is not just about sailing, but just as much to have fun, get together, and help each other. We tried to mix the teams, so there are veterans- including Dorte Jensen with a host of Olympic campaigns behind her- and young girls mixed together," continued Josefine. The WOW organizers invite women to the WOW meeting on Thursday, September 20th, entitled "Women on the Podium”, at HORTEN Lawyers in Tuborg Harbor. "I've learned more about team dynamics by sailing than by going to work over the years. I have used my sailing experiences a lot in my work life. And, this is about focusing on the fact that there are too few women represented in boards and management positions in Danish businesses. Subsequently, the participants from the Thursday meeting are invited to sail at the WOW event in Sundby the following weekend. Here the participants could get a ride on a J/70 with some of Europe's best women sailors; and, further the opportunity to strengthen their network. So, it's not just about sailing together, but also helping each other in relation to the things we do- networking and collaboration," explains Josefine. 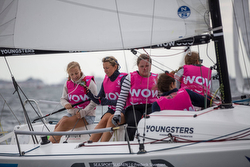 Follow the WOW Women’s sailing event on Facebook Facebook video highlights For more Danish J/70 Sailing League information Add to Flipboard Magazine.